bartending job because they know a few drinks and have also been the bartender at a party. Nothing can be further from the truth. Bartenders can easily earn $150-$300 daily with their salary and tips. This is a good paying job and owners and managers know it. This is why they are particular about who they hire. They want to make sure that the person applying for the job knows mixology, customer service and alcohol awareness before they put them behind their bar. 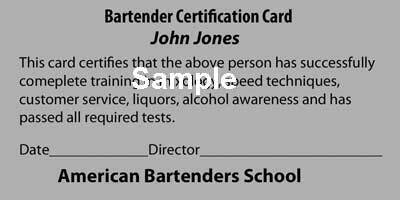 There is no official bartending license or certification that’s issued or needed to start bartending in mosts states or cities. However, finding someone to hire you without bartending job experience or a certificate from a state licensed bartending school, it’s almost impossible to get a bartending job. An approved state department of education licensed bartending school is very helpful because the certification shows potential employers that you have been trained in the basics. Licensed bartending schools have real working bars where the students get hands on experience making the most popular drinks. Most state departments of education require bartending schools to have programs that are 32 hours or more. These schools have excellent job placement departments where they assist graduates in finding full or part time jobs. I recommend that you visit a school and watch a free class. This will give you an opportunity to meet with the instructors and speak with current students. American Bartenders Schools in NYC, NJ and Palm Desert, Ca. offers a free introductory class.